"Walter The Artist" has been added to my website! 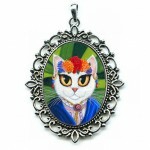 I LOVE how he turned out & hope you do too :D "Walter The Artist" Jewelry, Gift Items, Prints & LE Canvases are here, https://tigerpixie.com/index.php?route=product/search&search=walter AND they are all On Sale 20% Off until next Wednesday, 8/22/18. "Walter is quite the Artist! 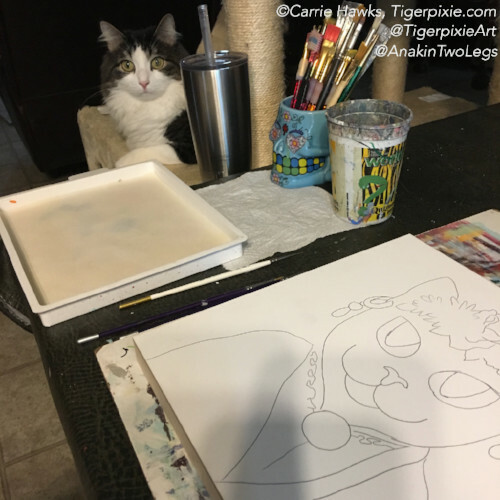 Behind him is his colorfully painted canvas with streaks, splatters, paw prints, and other fun doodles. 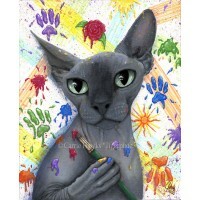 Walter is the handsome Sphynx Cat that Michael Banks (He's the awesome artist Sugar Fueled ) and his wife Sarah have. Walter even has his own Instagram @sugarfueledwalter"
Please let me know if you have any questions at all or if you have any issues at all with my website or checking out. 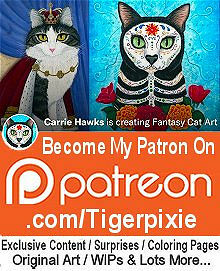 You can either message me through Patreon or email me at Chawks@tigerpixie.com and I will get back to you asap. I will be posting this months Giveaway soon too! :D Yay! "Senorita Cat" has been added to my website! Just in time for the gallery show! 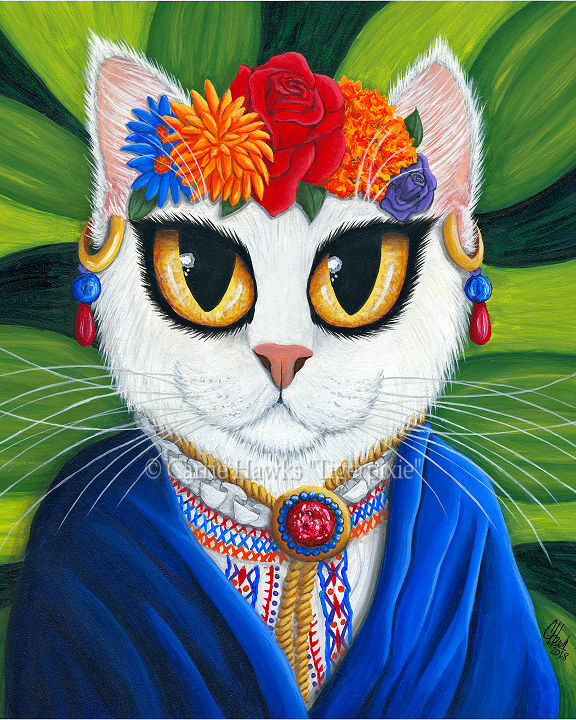 I cropped the original image so I could easily make my rectangle prints ;) More info about that & the show below ;) "Senorita Cat" Jewelry, Gift Items, Prints & LE Canvases are here, https://tigerpixie.com/index.php?route=product/search&search=senorita AND they are all On Sale 20% Off until next Saturday, 9/29/18. 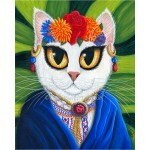 The Original "Senorita Cat" Painting is for the La Bodega Gallery Perfect 10 Group Show Opening this Saturday Evening! It is a 10" x 10" Acrylic on wood cradled Ampersand Gessobord sealed with UV protectant and varnish. She is ready to hang right on the wall. Priced at $400.00, Please contact the gallery at labodegastudios@gmail.com if you are interested in purchasing her. September Patreon Surprise Time! New Pins! 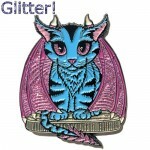 "Blue Dragon Kitten" Open Edition Pin! 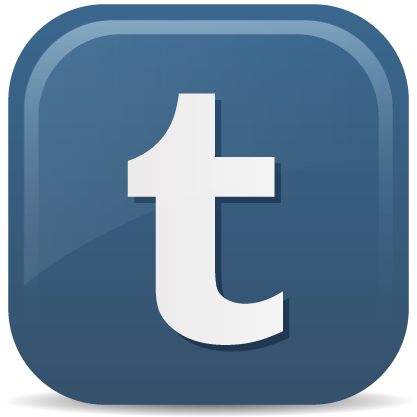 The Random Patron Surprises will be on Friday, September 28th around 7PM CST by random name generator. 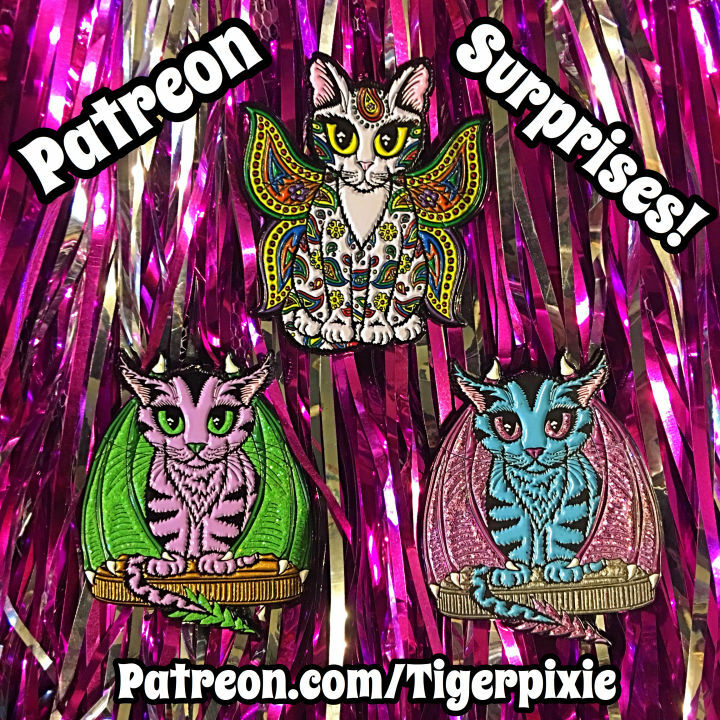 Everyone signed up on my Patreon at https://Patreon.com/Tigerpixie before that time at the $1 Reward Tier and Above will be automatically included! 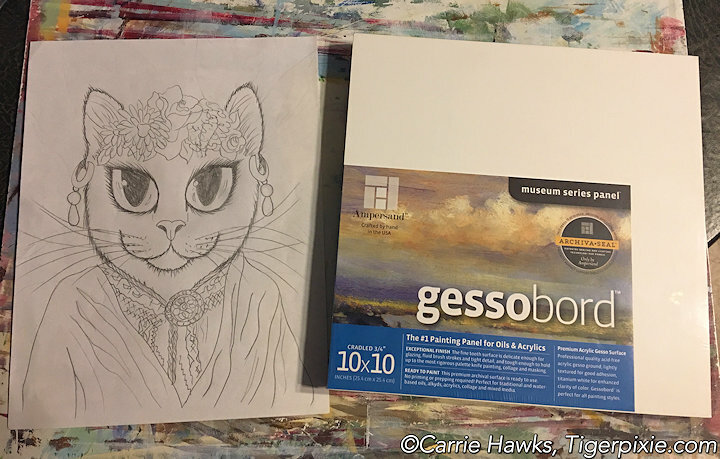 I will post the Surprise Patrons on my Patreon page and will contact the them privately to confirm their shipping address. 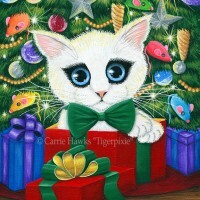 Welcome to the private group for Carrie Hawks "Tigerpixie" Me! 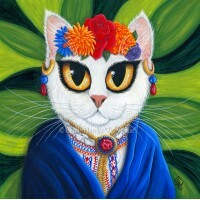 :) I would like this to be a fun place for people that enjoy my artwork to share and connect with me and each other. Please be nice and treat everyone the way you would want to be treated. This is a drama free zone. No Selling in the group. Please handle anything of that nature privately somewhere else outside of the group. 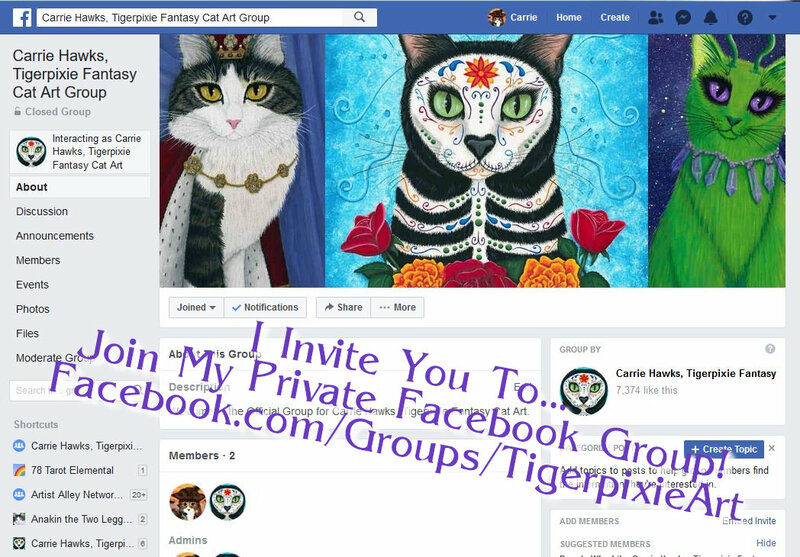 Yes, you may invite friends to join that you think would enjoy my artwork and this group. I don't have anymore shows until next year! Wow! 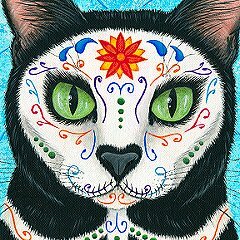 So I want to Paint! A Lot! 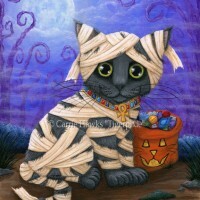 :D I'll be painting something cute and Halloween themed next! :D Yay! I'm also looking into getting a few more pins made. 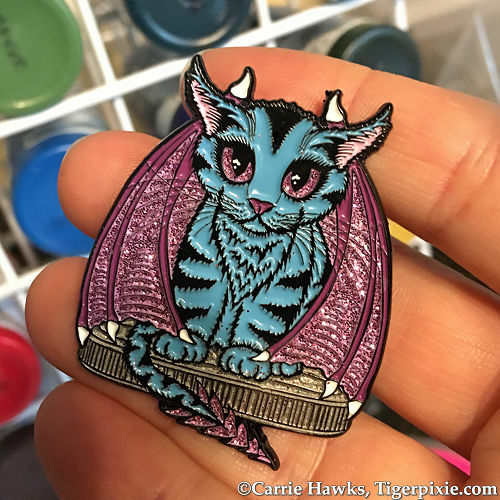 If there's an image of mine that you'd love to see as an enamel pin please let me know. 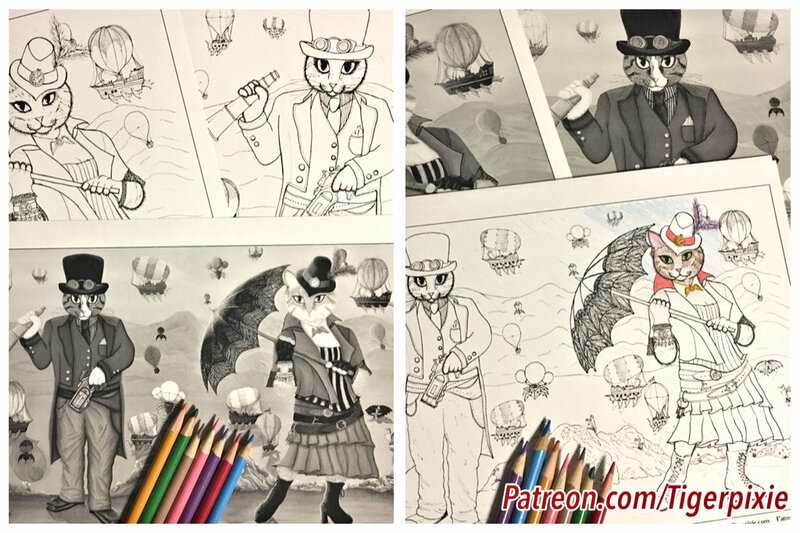 As always, I'll be posting regularly on Patreon with what exactly I'm doing if you want to pop in there and take a peek! 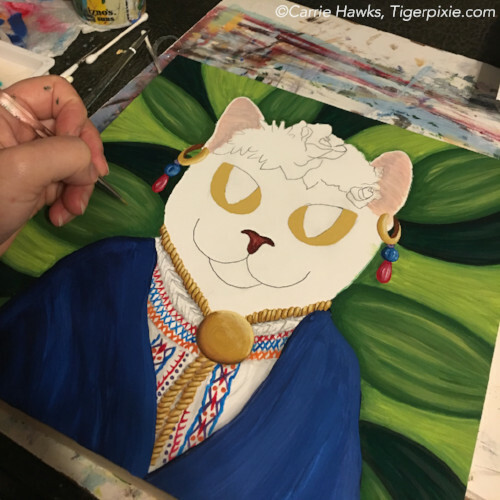 I hope that you enjoy my "Senorita Cat" painting, "Blue Dragon Kitten" Pin and Patreon Perks! Thank you so much for your support! 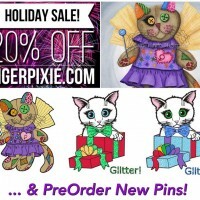 As always please feel free to email me, questions@tigerpixie.com with any questions, suggestions or requests.